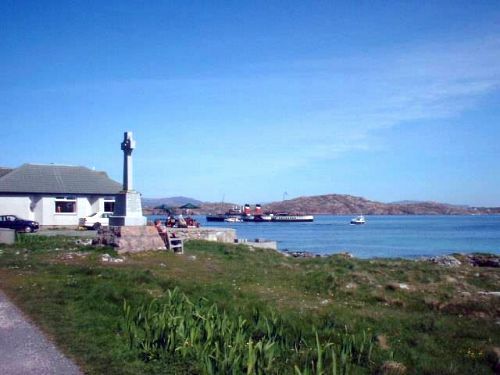 McBrayne's "Waverley" - the last sea-going paddle steamer in the world - paying a visit to Iona. Iona is a small island off the west coast of Mull, often described as the birthplace of Christianity in Scotland. It abounds in beautiful scenery and interesting wildlife and is separated from Mull by Iona Sound (above) which, on a fine day, is an artist's dream of turquoise! Saint Columba arrived here by coricle from Ireland and was given permission to build a monastery by the kings of Gaeldom in 563AD. Following the 2nd World War the monastery, which had fallen into disrepair, was restored when the Rev. George McLeod, minister at Barony Church, Glasgow, led the Iona Community Project when many volunteers - mostly young people - worked together to restore this great Christian Centre. You can pay a day visit by car or bus-tour on McBrayne's Ferry from Oban, "The Isle of Mull"